Make life easier for those with a visual impairment. With our low cost braille dogtags you can tag virtually anything to help identify similar items by touch: clothing, food, wine, keys, colors, sizes, music, flavors, values, price tags, etc. 2 x Military grade embossed Dogtags or Steel plaque. 2 x Stainless Steel chains (for wearing), or screws, rivets, or nails for mounting. Customize to Buy your Braille Assist Tags now! Our Braille signs & tags are completely customizable to meet your specific requirements... at a fraction of the cost of other braille sign manufacturers. 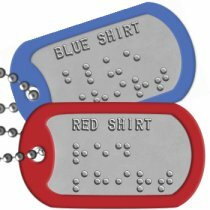 Choose from a selection of different sized dogtags, plaques, and materials to make your own custom braille tag! 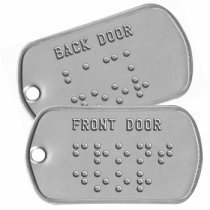 Our stainless steel, military grade dogtags are ideal for braille as they won't wear down as quickly as aluminum or plastic. Made by machine (not handmade) they are highly accurate and legible and are similar to ADA braille standards. Need help in creating your braille message? Read Braille Basics. 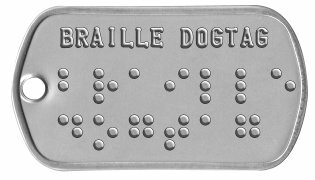 With our Braille Dogtag Generator you can create any 6 dot Braille cell system so that you can incorporate Grade 1, Grade 2, or any Braille contraction that you require. Braille is a system that enables blind and visually impaired people to read and write through touch. A cell is made up of six dots that fit under the fingertips, arranged in two columns of three dots each. Each cell represents a letter, a word, a combination of letters, a numeral or a punctuation mark. See the Braille specification guide from BrailleAuthority.org. for more specifications. All orders are shipped within 1 business day and are usually delivered within 1 week (in North America). If you need any assistance creating or ordering your Braille Assist Tags please contact us directly, we are here to help!